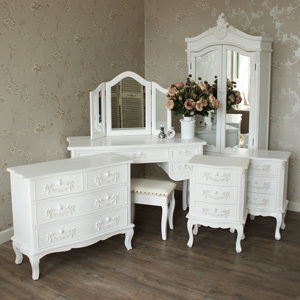 Wardrobes, chest of drawers, bedside cabinets, in a stunning heavy weight wood, all fully or almost fully assembled, with ornate french style detailing,in antique white. 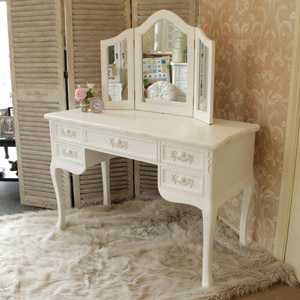 Perfect for the vintage, French or shabby chic style bedroom. Bedroom furniture made to last, and priced to entice. Large sized bedroom pieces, and smaller pieces, suited to cottage sized room are available in this elegant bedroom furniture collection. It is hand painted in a stunning antique aged look white colour, with very light distressing and fabulous hand carving which bring the whole range together. 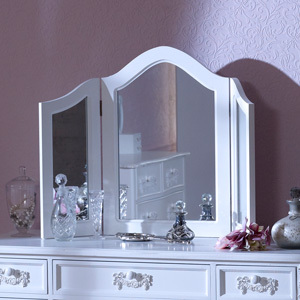 This range would be complemented beautifully with a light coloured floral bedding, creating an all round French feel.